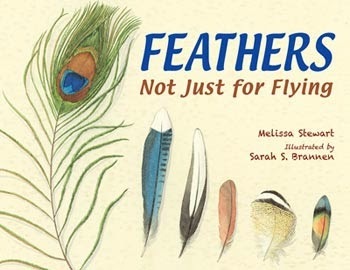 Today I’m giving my slot to Sarah S. Brannen, the uber-talented illustrator of Feathers: Not Just for Flying. It had me at hello. I read the first sentence of the manuscript that would become Feathers: Not Just for Flying, and I wanted to illustrate it more than any book that had come my way before. I love drawing natural things like rocks, moss, bones, or feathers, but I hadn’t yet had the opportunity to illustrate the things I do best in a children’s book. 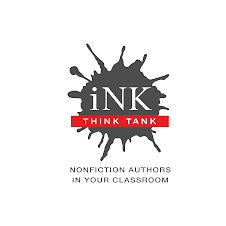 Several years went by before I was able to start; Melissa had to finish the book and get a contract for it, and the publisher, Charlesbridge, had to find me—I was eagerly waiting to be found—and spend some more time finalizing details. At last, in the fall of 2011, it was time to start sketching. Although I had been wanting to illustrate this book for years, once I read the manuscript over a few times, I realized that it was going to be an unusual challenge. Each bird discussed had two separate pieces of text, which had to be presented separately. 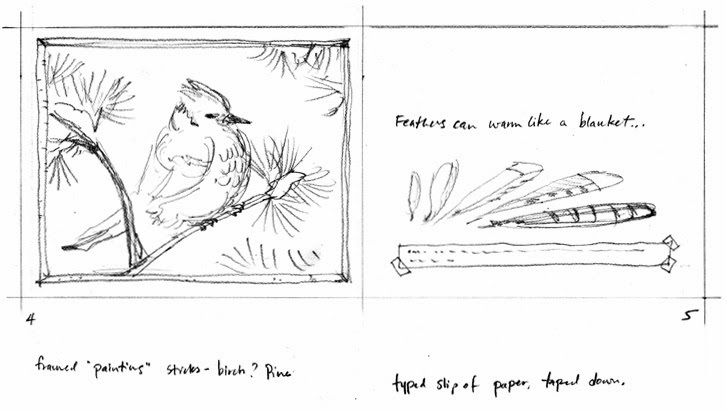 I was convinced that I couldn’t illustrate a book about feathers without drawing actual feathers, but because of the text, it was clear that each illustration would also need to show the bird doing the action described. And I wanted to add another set of illustrations. 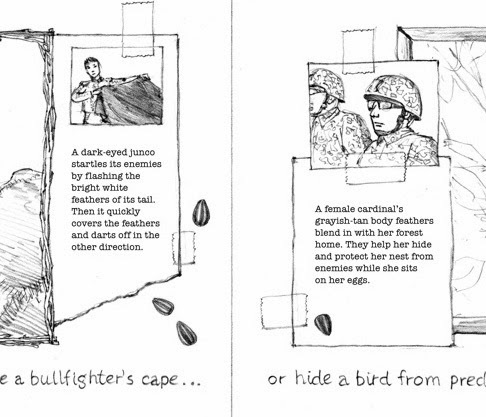 The similes in the book compare feathers to blankets, cushions, matador capes, fishing sinkers, etc. ; I felt that it would be necessary to illustrate some of the things a young child might not be familiar with, like a matador. So each spread had five different elements; ten, in the cases of spreads that showed a different bird on each page. I couldn’t think of how to pull it all together in a coherent design. I went for a walk, as I always do when I have a tough problem to solve. I wish I could explain how I came to the idea of a trompe l’oeil scrapbook, but the idea just burst into my head full-formed, as I walked along North Road near my house. Actually, my first idea was that each page would be the drawer in a curio cabinet, laid out like a collection, with the words written on a background, cut out of “magazines,” scribbled on sketchbook “pages,” etc. Then the main illustration could also look like it was a photo, or a piece of art, and the feather could lie on top. Everyone liked the idea, although it eventually changed from a cabinet into a scrapbook. I did a lot of research to find images of birds doing the things discussed in the text. 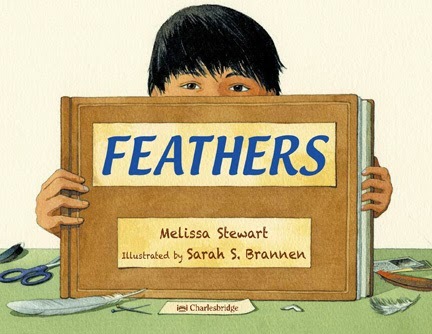 I had been picking up feathers for over three years, hoping against hope that I would someday illustrate this book. I had to spend a lot of time identifying them, and figure out how to get feathers from some of the more unusual birds. A rosy-faced lovebird owner in Iceland sent me some feathers from her pet. A scientist in New York and a nature photographer in Australia sent me high-resolution photos of the club-winged manakin and the sandgrouse, respectively. The red-tailed hawk was easy… I was mowing the lawn one day and found a wing feather in the grass next to my house. After all the research, the art went quickly and it was a delight. I loved drawing the feathers. Along the way, someone mentioned to me that it was illegal to possess wild bird feathers. I didn’t believe them. But I told Melissa, and we looked into it, and discovered that under the terms of the 1918 Migratory Bird Treaty, it is illegal to possess feathers from a long list of native American birds. (It is legal to possess feathers of non-native species like peacocks, lovebirds, and mute swans; domestic fowl like turkeys are also okay). I learned to draw feathers where I found them, and I’ve actually done a series of drawings of feathers on rocks, or sand, which turned out to add an interesting layer to the art. However, the whole idea of the book was to encourage children to make a scrapbook of natural things, to study and learn. Obviously we couldn’t recommend that children engage in an illegal activity! The publisher talked to the Department of Fish and Wildlife and was told that although enforcing this aspect of the act was not a high priority, that it is illegal to possess the feathers of any bird on the list. It may sound absurd, but when the law was enacted, many species were threatened by the fashion of wearing bird wings and feathers in hats, and egg collecting was very popular. Although picking up a feather a bird has dropped doesn’t harm the bird, there is no way to prove where you got a feather once it’s in your possession. So it does make sense, once you think about it. Ultimately, it was decided to remove the tape which showed the feathers being mounted in the book. The scrapbook look remains, and the illustrations of the feathers accompany the illustrations rather than being intrinsically part of them. We had a slight story idea that was cut—there had been an illustration of a child holding the scrapbook on the original title page, and it was dropped. It was a long, labor-intensive, complicated process, and the book was published over five years after I first saw the manuscript and fell in love with it. I’m very proud of how it turned out, and I can’t wait to share it with the world. love the passion and the way you honor nature…thanks for the insight. Thanks so much for the details of how you poured your passion into this book. Fascinating! Great post. It's always so interesting to hear the nudges and inspirations and roadblocks that all contribute to the creative process.